Resource: Something that a computer uses to get work done, such as memory or processor power. Shared: When a resource is made available for others to use on the network, that resource is said to be shared. So Serge can share his color printer or Antoinette can share extra hard drive space, making them available for use by anyone connected to the network. 802.11: The number 802.11 refers to the current wireless networking standard. The 11 is followed by a letter: a, b, g, or n, which describes how old the standard is (n is the newest and fastest) and how compatible two wireless networking gizmos can be. Ethernet: The standards and protocols used by Windows for networking. Ethernet is the most popular personal networking standard, and it’s a standard for communications on the Internet, as well (which is why networking is closely tied to the Internet). 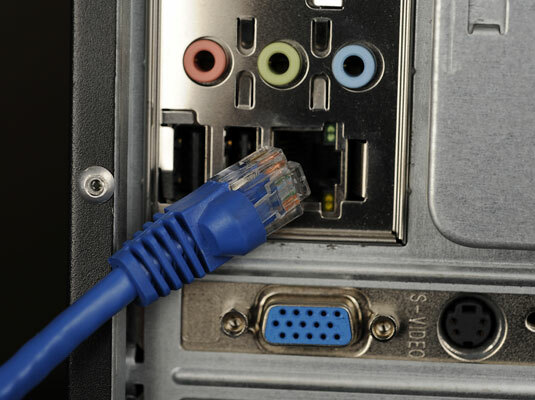 Your PC should have an Ethernet port, into which you plug an Ethernet cable (both shown in this figure). LAN: When you connect a group of computers to form a network, it’s a local area network, or LAN. Peer-to-peer network: A network that simply connects computers is known as a peer-to-peer network. In that scheme, no single computer is in charge; each computer is “on the network,” just like any other computer. Client-server network: One main computer runs special server software, acting as the network boss.